In an increasingly homogenized world, consumers in all categories are craving authenticity and originality – and nowhere is that more evident than in the hotel industry. One survey of 1000 hoteliers found that more and more guests are rejecting cookie-cutter hotels in favor of those that help them experience the true essence of a place – they want to live like a local for a few days. It’s a trend brought on by the home sharing movement of Airbnb and the like, but now hotels of all types and sizes are getting creative – and competitive – by providing a more “handcrafted” local experience. Hotels are filling up rooms in a whole new way – by getting guests out of them and into the local scene. Concierges, the long-time hotel link to local favorites, are getting out from behind their desks – like one at a Montana lodge that personally leads guests along eighty miles of Nordic ski trails, or another who guides guests through the hidden corners of London. And then there the virtual concierges, available 24/7 via hotel apps, always on-hand for live-chat advice as guests tour the town on their own. Hotels are also bringing the local flavor in-house, with one-of-a-kind design and food elements. Lobbies are transforming to co-working spaces, where guests work and mingle amid local art, enjoying artisanal bread from nearby bakeries or small-batch whisky from the neighborhood distillery. These unique local touches have become a not-so-secret weapon for independent hotels, which are free from big-brand uniformity and better able to adopt a truly local personality. Their smaller size gives them the agility to adapt quickly to new local trends, and their status as local business provides better access to local relationships. That can mean partnerships with local chefs, to satisfy foodies, or with community groups, to get guests involved with locals in everything from learning to volunteering opportunities. For highly adaptable and creative independent hoteliers, the possibilities are endless, and ever changing, keeping the experience they offer both authentic and perpetually fresh. And the result? Independent hotels are growing at twice the rate of the big chains. The big hotel groups, however, are by no means ceding the experiential travel market to their boutique competitors. Instead, they are innovating with technology and experience-based brand extensions. For instance, the above-mentioned live-chat concierge app was developed by the Ritz-Carlton. And Marriott’s new Moxy brand looks to deliver authentic slices of local living; its Times Square location features tiny rooms (183 square feet) that the chain says mimics the inventive “urban camping” lifestyle common to so many studio-dwelling Manhattanites. 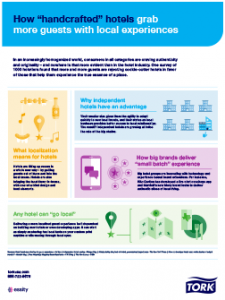 Fortunately, delivering a more localized guest experience isn’t dependent on building new hotels or even developing apps. It can start as simply as sharing fun local facts on your custom print napkins or hosting free group walking tours that serve both as social mixers (experiential travels tend to be younger) and site-seeing through local eyes. Given that the point of localization is to deliver a unique experience, available only at your location, no one else can really tell you how to accomplish that. So go on, get creative, be authentic – and watch the guests roll in. Gensler blog: How can boutique hotels cater to the desires of today’s traveler?